The Betfred game involved two cyclists on a screen in shops racing on a velodrome track with numbers on it. When the cyclist at the rear catches the one in front, the number they are on is the winning number.The numbers are 1 to 36, mirroring those on a roulette wheel, and other bets can be placed on odd or even numbers, colours, rows and columns. Customers could bet up to ?500.Paddy Power's game, with a maximum stake of ?100 - the level before this week's FOBT rule-change - also involved betting on numbers between 1 and 36. Ahead of the commission's intervention, both firms drew fire from critics. 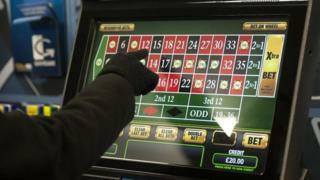 Shadow culture minister Tom Watson described them as "FOBTs through the back door". Tracey Crouch MP, who resigned as sports minister over the delay in cutting FOBT stakes, said any attempt circumvent this week's changes to the maximum stakes "would be morally irresponsible".In a statement on Tuesday, Richard Watson, executive director for enforcement at the commission, said: "We have been absolutely clear with operators about our expectations to act responsibly following the stake cut implementation this week. "We have told operators to take down new products which undermine the changes, and we will investigate any other products that are not within the spirit and intention of the new rules. ''He said that a third bookmaker that was poised to launch a similar product to those at Paddy Power and Betfred had been warned against doing so.A Betfred spokesman said: "We removed the virtual cycling game and all associated marketing at 10.30am this morning after discussions with the Gambling Commission. "A Paddy Power spokesman said: "We offer our retail customers a range of number-based betting products and this game was introduced as part of a short trial in a selection of shops. This trial concluded earlier today and we will now assess the customer response and feedback before deciding whether to launch it more widely."